The PDF version of the pattern is only 18 pages long when printing in A4, so there's really not much cutting and sticking to do - though if PDFs really aren't your bag, you can order a printed version. The instruction booklet is beautifully designed which is great if, like me, you're the sort of person who likes to display your favourite printed patterns! The fab level of design extends beyond the cover too - the instructions are well laid out and the illustrations are some of the clearest I've seen. I cut a size D from the A-F size chart (UK 6 - 16/US 2 - 12 equivilent) which was an exact match for my waist measurement. I could have sized down by 2 sizes on the hips, but chose not to as I wanted them to be loose and retain a bit of volume in the legs to balance out from my waist measurement. 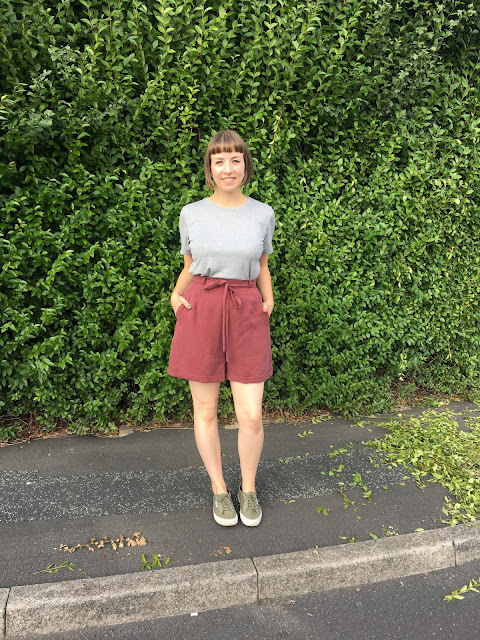 I used a mid-weight cotton - the closest thing I can liken it to is a sort of brushed cotton - as I had plenty left over from making these B6178 culottes. 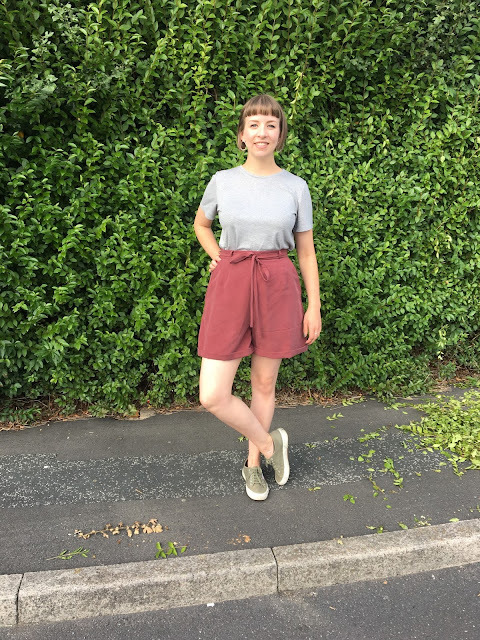 The culottes would probably work better in something lighter with more movement, but it holds the shape of the Fern Shorts really well. It was a really straightforward sew that would suit anyone from an advanced/adventurous beginner to someone who has been sewing for years. 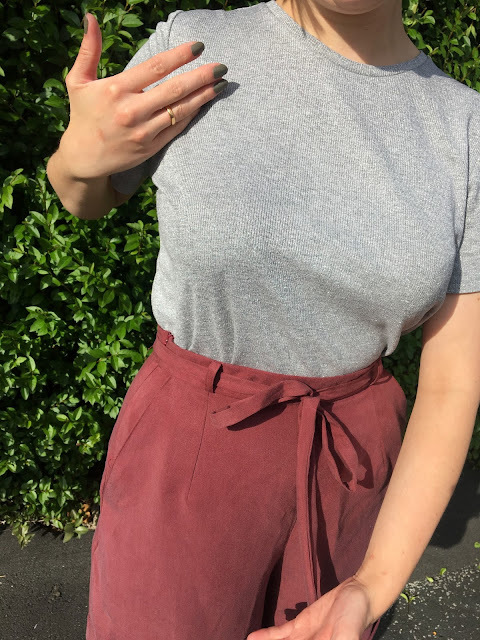 I personally found the pockets the hardest to set in, but this might just be because it was my first sew for a month and I was feeling a little rusty. It would have been nice to have a few more pattern markings to help with this step and this is something that I fed back (*note: as a tester, the pattern I worked from wasn't the final version, so it will be the new and improved version that's released for sale). I topstitched my pocket opening for a neater finish - a bit like the pocket openings on the Joanne Culottes - just because I really love topstitching. 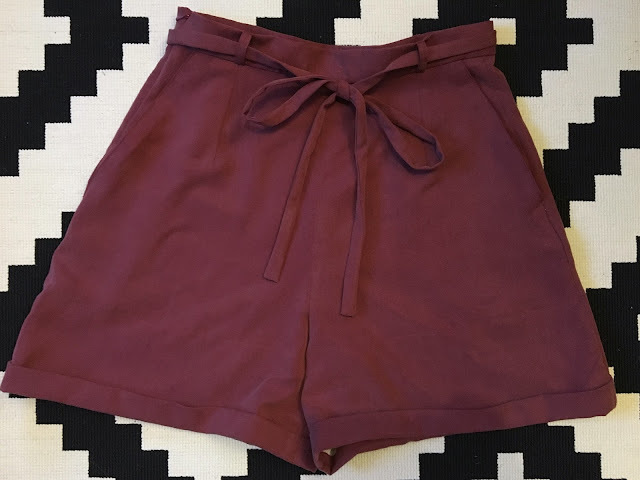 The shorts fasten with a concealed zip at the right side. 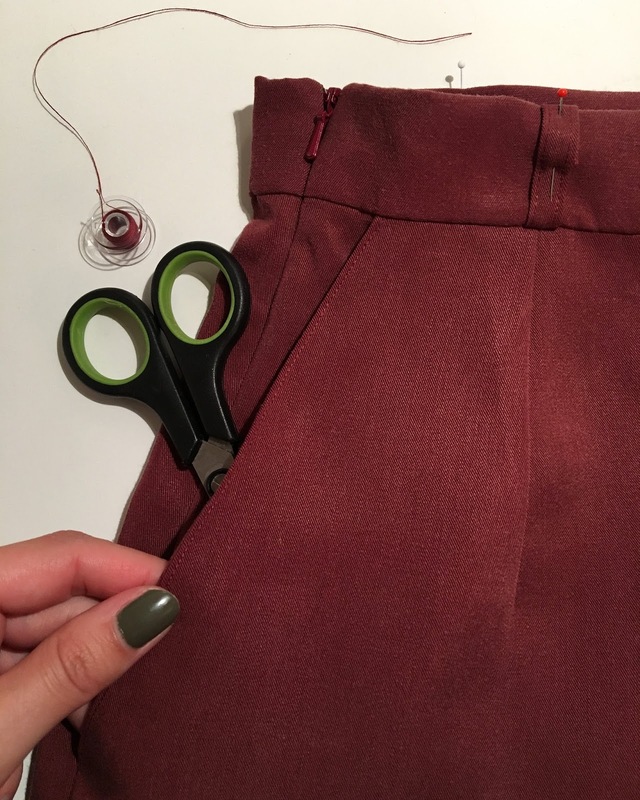 I'm the sort of person who would usually avoid garments with a side zip for fear of it being more difficult, when the method is actually exactly the same as normal - does anyone else make up unnecessary sewing fears? It makes for a much neater finish to have the zip tucked away and concealed by a side seam and it was actually really easy to do! As a note, I needed to use a loop turner for the belt loops and the tie. The tie is really long and I'm not sure I would've had the patience for the safety pin method. It's actually a bit skinnier than I thought it would be, so in future, I'll probably take a smaller seam allowance to make it a bit wider. 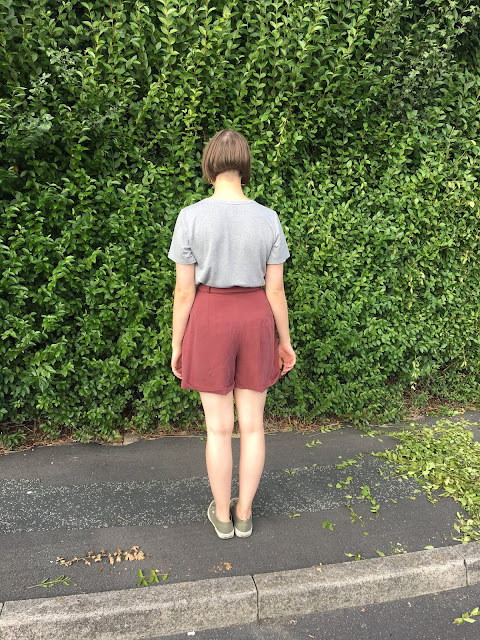 One big thing I learnt from making the Fern Shorts is how to do proper turn ups - finally! 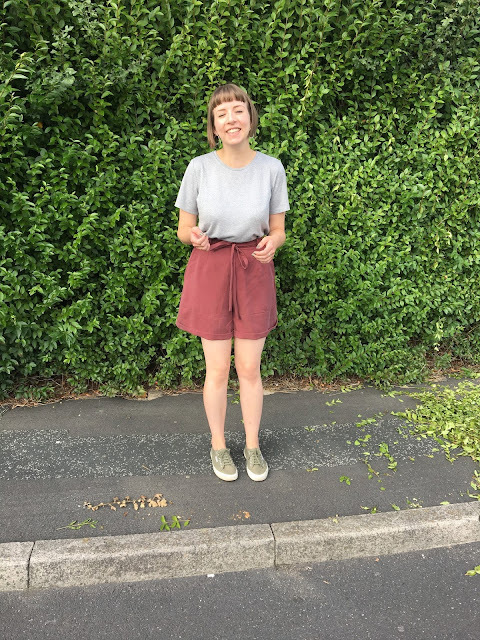 I can't tell you how long I laboured away on unsuccessful turn ups for these vintage pattern trousers before giving up. The only thing I need to do with my Fern turn ups is to pop a couple of stitches in the centre back to hold them in place, as you might be able to see from the back image. I'm not a usual shorts wearer an I haven't worn them since my 'vintage kilo sale' phase at uni - ill fitting cut-off Wranglers and tights anyone? - but the style of the Fern Shorts has totally changed my mind. There's something about the wide legs and turn ups that make them seem cooler and a bit more 'grown up'. I love Fern's shaping, particularly around the waistband through to the pockets, and I'll definitely be using them as the base for a culotte/wide leg trouser hack in the near future. Thanks Jen for letting me test the Fern Shorts. I can definitely recommend the pattern and I wore mine all bank holiday weekend as we actually got some sun! I'd love to say that I'll be making many more pairs straight away, but unfortunately the UK weather probably won't be up to it - next summer though! The Fern Shorts are available to buy now here. 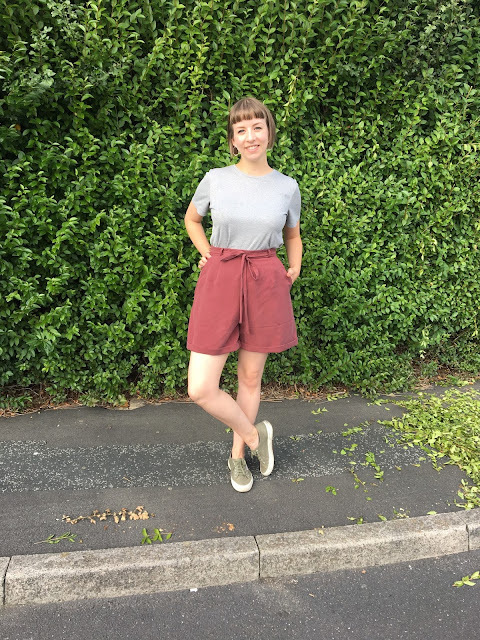 Also keep your eye on the Afternoon blog for the Fern sew-along - previous sew-alongs have been super thorough, so it's definitely something to look out for if you need a bit of help along the way or are learning new sewing skills! Now what fabric should I choose for my Fern-culotte hack? I really, really and I mean REALLY like the look of your shorts Shauni! I've been on the hunt for good Patterns and these are going on my list! Love your shorts! I think you picked the perfect fabric to showcase their design features really well and as I was reading your post I was thinking the same thing that these are just calling to be hacked into wide legged pants! I, too, am not usually a shorts wearer, but these look like they won't infantilize or motify me. Nice work. They look great on you! Just Patterns Linda Wrap Dress (turned jacket)!